링그 크리스마스 Plan. Poor Link. HD Wallpaper and background images in the Super Smash Bros. Brawl club tagged: super smash bros. brawl link roy marth zelda christmas. wth does marth do to get involv in everything???? This is what happens when you dont act fast enough, link. Lol, i remember seeing this picture on Photobucket aswell. Good work! To Gazlover : Um, NO FREAKIN' DUH!! !, OF COURSE IT IS FROM SUPER SMASH BROTHERS BRAWL!!!! The actual comment: I wish that would happen to me and pit, a kiss under the mistletoe. cryistal dose a face palm then she says " link"
Link, why not stick some dinimite in his mouth! 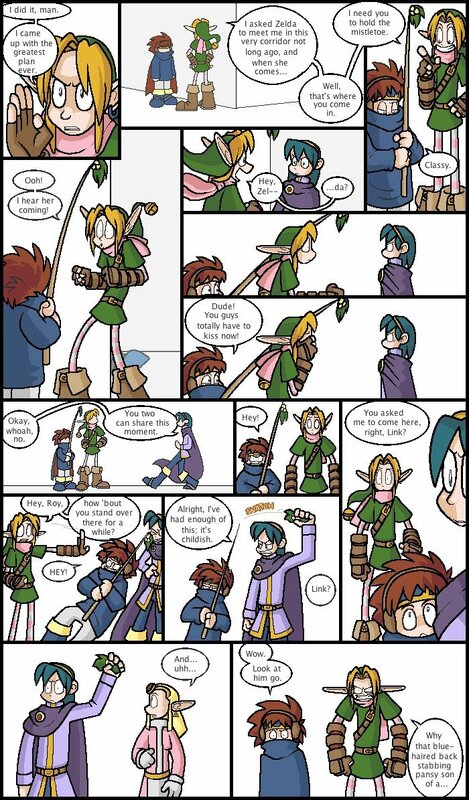 i would, I had told link that after this happened, after all i know all the Nintendo characters. Link directly said to me " if you like that blue haired Thieving Freak i will rip out your voice box !". I said "No link, I hate Marth. i came to help find a plan to kill him! " He proudly said "Can you kill Zelda To?" I was surprised about Link, To kill Zelda?